Matt Lewis is a 2002 graduate of the College for Creative Studies. 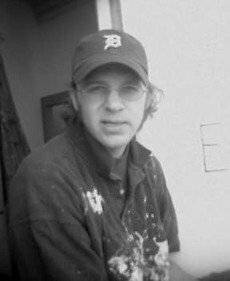 He is active in the Detroit Arts Community and currently teaches Art at the High School Level. He has been very active in the Detroit area and throughout the state. He has exhibited at the BBAC, PCCA, The Scarab Club (silver medal exhibition), The Detroit Artists Market, The River'sEdge Gallery, Higher Art Gallery in Traverse City, Gallery 50 also in Traverse City, The Saginaw Art Museum, The 4731, Corktown Gallery, and on and on. His work is in many numerous private and public collections including The College for Creative Studies, GM, The Nemer Group, and the Kreisler Foundation. My work evolves out of a necessity for the work to come into being. The work is a necessary activity for me in terms of a meditation, reflection, and possibility of self actualization. The work has become more focused in recent years on thoughts and meditations of spiritual exploration and psychological activity, both conscious and unconscious. These recent pieces are for me, Psychological Landscapes. These Paintings and Watercolors explore an imaginary psychological landscape that is easily accessed by our own understanding of both figure ground relationships and the familiarity of the landscape format. These works have no specific narrative and instead utilize a matrix of what I consider to be personal mark making activity. This activity results in the creation of unconscious personal symbols that represent for me the idea of the unknowable, or the unknowable by intellect, in effect, the idea of symbolizing what is instead a part of you, and therefore transcends knowing and unknowing. It is therefore a representation of the mystery, and a record of a meditation.